Vietnam and the Netherlands are further boosting strategic co-operation in water management and adaption to climate change as part of a plan for the two nations to forge a bilateral comprehensive partnership. Last week, Dutch Minister of Infrastructure and Water Management Cora van Nieuwenhuizen and Vietnamese Deputy Prime Minister Trinh Dinh Dung witnessed the signing of the letter of co-operation between the Vietnam Academy for Water Resources and the Netherlands Embassy to Vietnam. Also inked was an agreement on implementation of the Orange Knowledge Programme, a Dutch expertise programme for developing countries, involving Vietnam’s Hanoi University of Natural Resources and Environment and the Water Resources University, and the Netherlands’ Delft University of Technology, and the University of Twente. These moves, which are part of efforts for the two countries to lift their current relationship to a comprehensive partnership in the near future, were made at the seventh meeting of the Vietnam-Netherlands Intergovernmental Committee on Climate Change Adaptation and Water Management in Hanoi, a sideline event during the second official visit to Vietnam by Dutch Prime Minister Mark Rutte. This specific co-operation is also part of support from the Netherlands in helping Vietnam in adaptation to climate change and effective water management. Minister Nieuwenhuizen said that the Netherlands also wishes to support Vietnam in other areas, such as implementation of a governance system and pilot activities. Accordingly, the governance system will improve management methods, make integrated plans, and provide a long-term sponsor for water resource management challenges. Dutch universities will exchange with Vietnamese partners, and help them improve curriculums. Additionally, the Dutch side will also help Vietnam build small projects on managing water resources which can be replicated to develop policies. “The Netherlands will co-operate with Vietnam in three ways. One example is in support of finance. We will invest millions of euros in infrastructure to manage water ­resources through our Support for Infrastructure Development and Development ­Related Infrastructure Investment Vehicle (DRIVE),” Minister Nieuwenhuizen said. The other two support schemes are related to ­technology and strategic ­consulting. Over almost 50 years since Vietnam and the Netherlands established diplomatic relations, co-operation in adaptation to climate change and water management has been the priority of the two countries, particularly since 2010 when they became strategic partners on climate change and water management. According to Minister Nieuwenhuizen, both countries recognised the deep ­influence of climate change since the turn of the century. Rising sea levels, strong storms, and land erosion have been increasing. River flows are also changing and droughts have become more regular in many places. The construction of upstream dams and downstream dykes can exacerbate those impacts. “We have to adapt. ­Increasing saline intrusion won’t be trouble any more if we help farmers adapt to changes in water sources. We need to continuously invest in infrastructure and solutions based on nature, ability of ­recovery, and protection,” the minister said. She also ­highlighted the sea level rise attacking the Mekong River Delta. “It’s not simply a challenge, but a threat determining survival,” she stressed. He said the ­Vietnamese government will further co-operate with the Netherlands to upgrade the strategic relationship between the two countries, and turn challenges caused by climate change into a chance for deeper co-operation for the common benefits of the two governments and peoples. Meanwhile, Minister Nieuwenhuizen also visited the central town of Hoi An, where a consortium of Dutch and Vietnamese companies have developed a plan to protect the vulnerable beach against erosion. The scheme is currently being discussed with the government in order to sustainably protect the coast against degradation by means of an artificial island in the sea. The minister also met with the Ho Chi Minh City ­People’s Committee to discuss water issues in the city and the Mekong Delta, how to finance water management initiatives to prevent flooding, and a public-private partnership proposal for flood prevention and solutions for land subsidence. For decades, the Netherlands has been one of the EU’s largest official development partners for Vietnam, greatly contributing to infrastructure improvement in general and Vietnam’s urban areas in particular. So far, we have five projects of clean water supply and waste treatment funded by the Netherlands. Their aid for our development has been mainly implemented through global programmes such as the Facility for Infrastructure Development (ORIO) and the Netherlands Initiative for Capacity Development in Higher Education. The Ministry of Planning and Investment highly appreciated the ORIO support tool, which was a practical financing tool bringing effective development of economic infrastructure for Vietnam’s localities. Since the end of 2016, the Netherlands drafted the Development ­Related Infrastructure Investment Vehicle (DRIVE) programme to replace ORIO to provide financial support for large-scale infrastructure projects in developing countries, including Vietnam. The agricultural policy for the Mekong Delta was focussed on rice cultivation. Policy instruments, such as production targets and subsidies together with a stable market, provide incentives for farmers. Given the combination of low water productivity, salinity intrusion, and erratic weather events, this is no longer considered sustainable in the coastal zone. Nor is triple rice-cropping behind high dykes in the upper delta sustainable. Agricultural transformation is an imperative to keep the area productive and profitable. The transformation is an opportunity to focus on crops with a higher value and water productivity. The switch to aquaculture and horticulture should however not result in practices that overexploit the groundwater or pollute the surface water. The gradual reduction of the retention potential in the upper Mekong Delta must be reversed. The Ministry of Construction (MoC) appreciates the positive co-operation and effective support of the Netherlands over recent years in water management in general and the Mekong River Delta in particular. 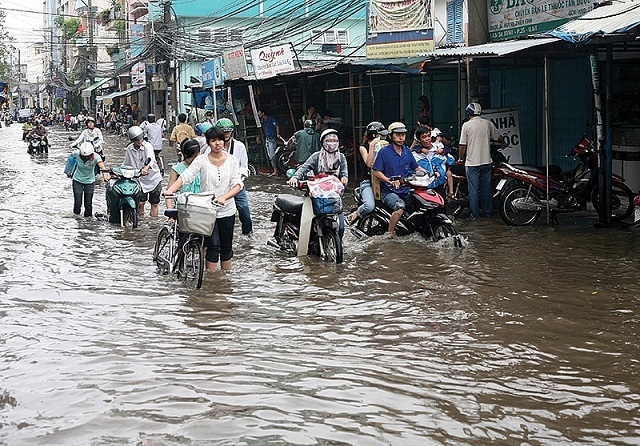 The Dutch government and Rotterdam authorities have supported Ho Chi Minh City in building a common database, a strategy for climate change adaptation until 2100, and a development action plan to implement a city-wide climate change adaption programme. This has helped staff of the city improve their capacity, and gain knowledge and experience from Dutch experts. The MoC encourages co-operation in public-private partnership with the Netherlands such as the flood prevention project in Ho Chi Minh City, the coastal erosion prevention project in Hoi An, and the study in urban planning to solve the dual problem of climate change and land subsidence in the southern province of Ca Mau.